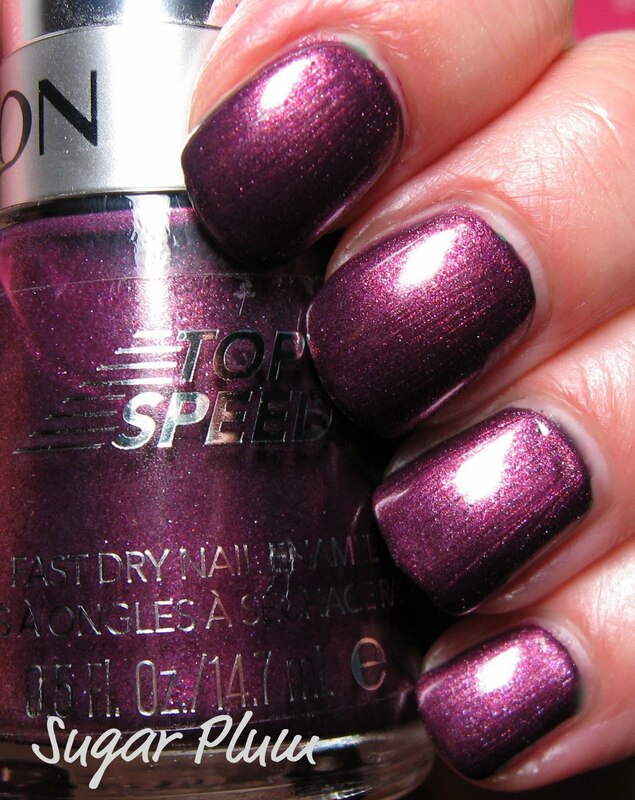 Revlon recently released a large (24 shades) new collection of what I consider one of their best polish lines, Top Speed. Many of my old original Top Speed polishes are among my most cherished. These are on sale buy one get one half off at Walgreens this week, and there's also a $3.00 coupon in the Rite Aid flyer if you're interested in picking up some shades from this line. I noticed a $5.00 Walgreens Jingle Cash coupon printed out on the back of my receipt, which I believe is a sign that I should go back and pick up a couple more of these! Above: Sugar Plum, a delightful plum shimmer with a plush dimensional effect, this shade also seems to have a slight charcoal base. This shade is further enhanced with red, silver and blue micro glitter. I found all of these shades to be highly pigmented and while they applied nicely, these do dry pretty quick. If you have a small area that you need to go over to correct, work quickly so that your application isn't flawed. 2 coats. Below: Orchid is a pinkish mauve tone with silver and pink micro glitter. I love the textured look that these finishes have. 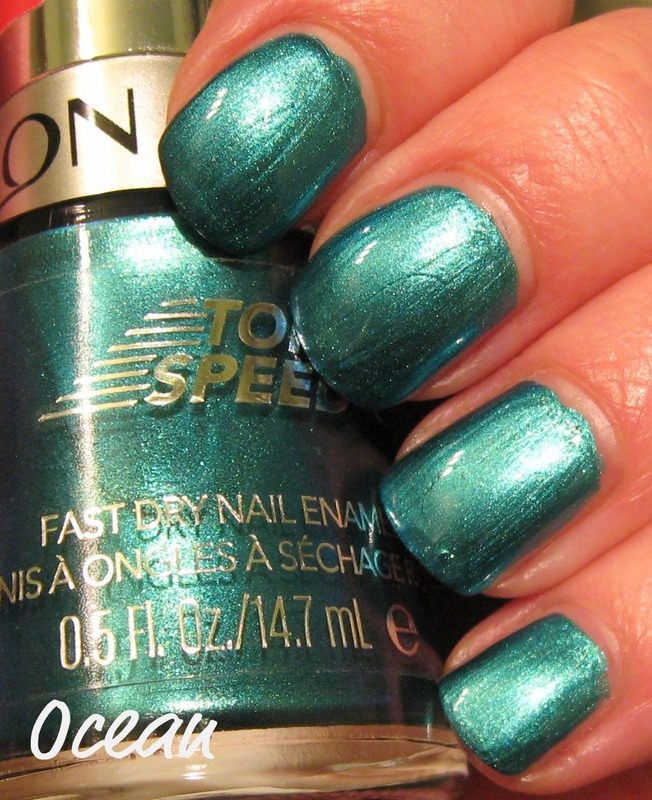 Both Orchid and Ocean below have a slight foil finish, and they applied almost streak free--if you work fast! When I removed these two, the polish on the cotton balls looked like a straight-up foil. Again, two coats. Below: Let Ocean (turquoise shimmer with gold and lighter turquise micro glitter) be my example to you of what happens when you forget that these are quick-drying polishes! This was the first one I swatched and you can see several flaws that when I went to correct them at my normal pace, it was too late. The fine piece of fuzz on my middle finger was already firmly embedded. You can see at the tips a bit of unevenness, because when I went to touch up a few light areas, it was already dry and I was unable to cover the brush marks when I applied the second coat. Once I remembered how quick these dried, I didn't have a problem with the other three. 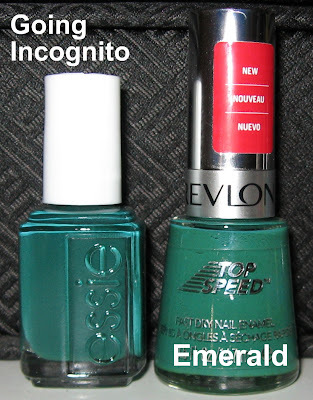 Below: This is one coat on Emerald, and there's just one small light area on my index finger, so it's very pigmented and applied like a dream. This creamy medium to medium/light green creme is similar to some other shades, but a very quick search didn't yield any exact matches. I'll have to do a more thorough search tomorrow and let you know if I find anything close. 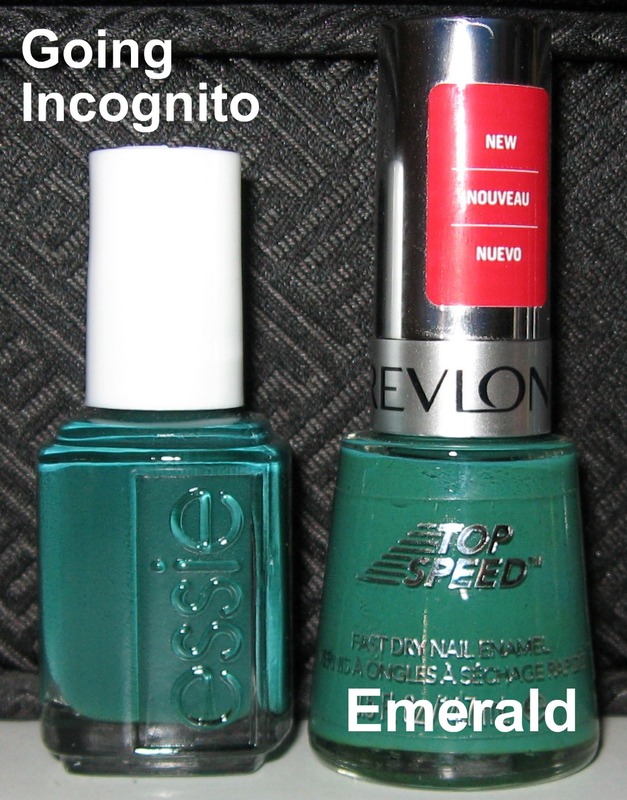 Below: Here's a quick bottle look with Essie Going Incognito, the first possible dupe that came to mind. No dupe there! Below: Another possible contender for dupe-dom was China Glaze Starboard from the upcoming Anchors Away collection. I was way off in my thought process on that one! You know, I really wasn't going to buy any of the new Top Speeds, because at first glance, a lot of them looked very similar to other shades. There may be some re-promotes in there or similar shades to other Revlons, I'm not really sure without going back and studying them a bit more. Even after I looked at them sitting on my desk all day, I thought "Why did you buy those? Surely they're nothing special." I never have too much of a problem admitting when I'm wrong, and so I admit. I was wrong! These are really nice polishes, from the formula to the colors. I love the micro glitter shimmer finishes, and Emerald is not only a great green shade, but it's virtually a one-coater. And they were on sale. Win. Omg! Sugar plum looks awesome! I picked up a couple of these at CVS tonight, but not these colors. I may have to go back. Emerald is pretty! 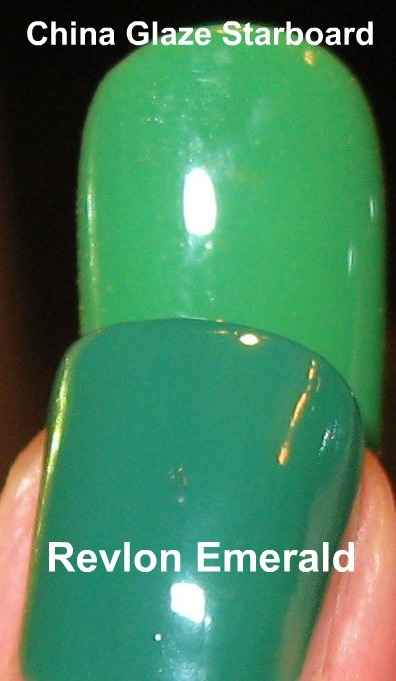 Maybe looks like OPI Jade is the New Black? 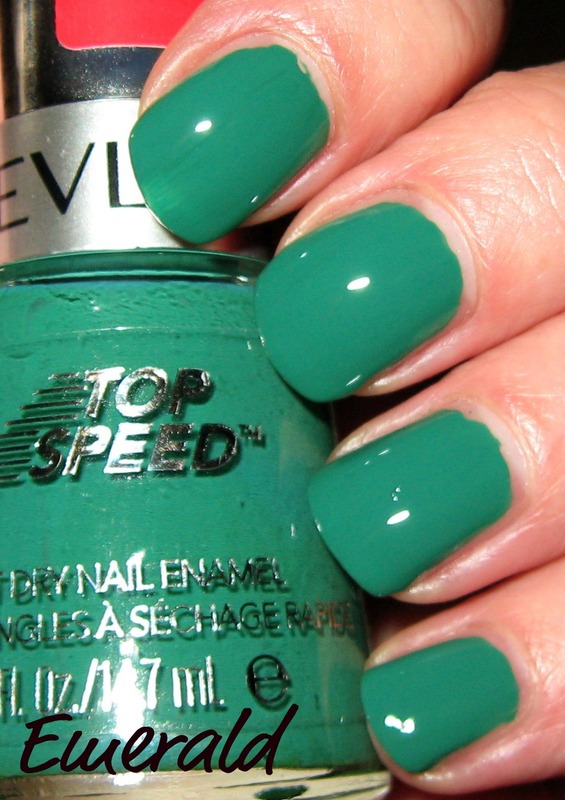 LadyLuck27~I love this shade! 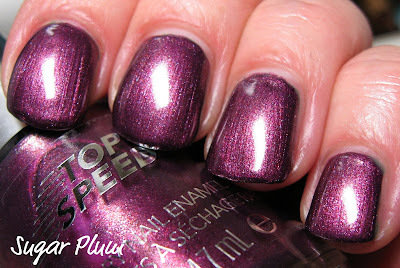 More plum than purple, gorgeous glitter and great application. my leetle nails~I wasn't sure if I should pick it up, but I'm glad I did. Still need to do some comparisons to see if it matches abything else I have, but the application was fabulous. Bruno~there are tons of other shades in this collection--couldn't believe how many polishes there were. Glad you like the ones I picked! Linen and Silk~aww, that's too bad. Mine is more plum and I thought it would be more purple. I actually like the plum shade, but it's not too pink on me. Saori~thank you, I'm very happy with the shades and formula on these. I have the first one! I also picked up grape in their list the darker purple. I LOVE sugar plums! I've been on the lookout for Royal - their cobalt shade - but I haven't found it yet. I think I need Sugar Plums and Emerald, too. Maybe Emerald is close to ChG Four Leaf Clover?